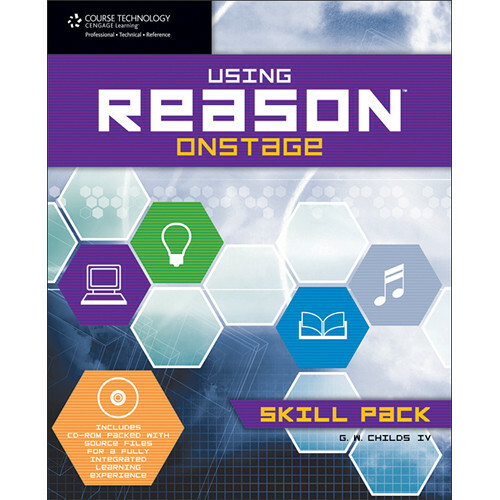 Using Reason Onstage: Skill Pack from Course Technology written by G.W. Childs IV quickly shows any Reason user, from the novice to the experienced, how to use Reason 4's power for onstage performance. The book starts out by providing valuable key commands that are helpful to know during live performance, and then moves quickly on to controller setups, song layout suggestions, and Combinator 2 tips and tricks that will dramatically improve any musician's onstage performance. In addition to covering basic functions that make live performance easier, this excellent book/CD package also covers advanced concepts that allow the user to walk onstage and compose on the fly. The accompanying CD includes presets and templates that you'll use to learn the concepts in the book. About the Author: G.W. Childs IV has been working in music and sound design for the likes of LucasArts, Propellerhead Software, Cakewalk, and Midway Entertainment. He is a featured trainer with Mac Pro Video and Lynda.com, and he has penned several books including CREATING MUSIC AND SOUND FOR GAMES, YOUR FREE OPEN SOURCE MUSIC STUDIO, USING REASON ONSTAGE: SKILL PACK, REASON 5 IGNITE!, and many, many more. G.W. currently resides in Texas, with his family and laptop.